When I was visiting Japan, a friend from the US who is living in Tokyo had planned to take me to an Indian restaurant. I suppose he was looking forward to this meal because he was a bit tired of Japanese food. It was cold and I did not bring enough covering for the unexpectedly cold air. By the time we walked to the very small restaurant at dusk, it was 7:30p.m. and the restaurant would not have a table for us until 9:00p.m. So we walked on. My friend was hoping to find a good Italian restaurant, but I requested to settle on the first noodle place we passed since it was dark and I was cold and hungry. The dinner was not so tasty. Tokyo-style soup broths are really not as good as Osaka ones; they’re just a bunch of soy sauces. 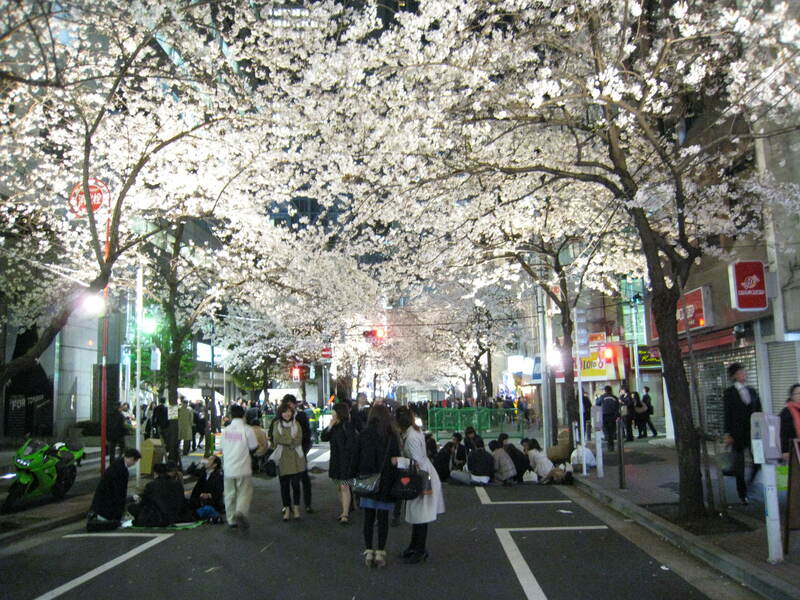 We started to walk back to my hotel and had gone about four blocks when all of a sudden a street filled with rows of cherry trees in full bloom, their blossoms light up for the night, appeared in front of us. People in formal attire were everywhere and getting drunk and silly. They had put cardboard on the ground, brought takeout and spirits for picnics and were having a good time. Walking further down, I saw a barricade blocking traffic. The rest of the block was even crazier and more crowded. A concert in front of Takashimaya department store was the brightest attraction. My friend told me that it was all because it was the first Friday of the month, payday for most people, and the cherry trees were blooming. I believe the Japanese payroll is made on a monthly basis. 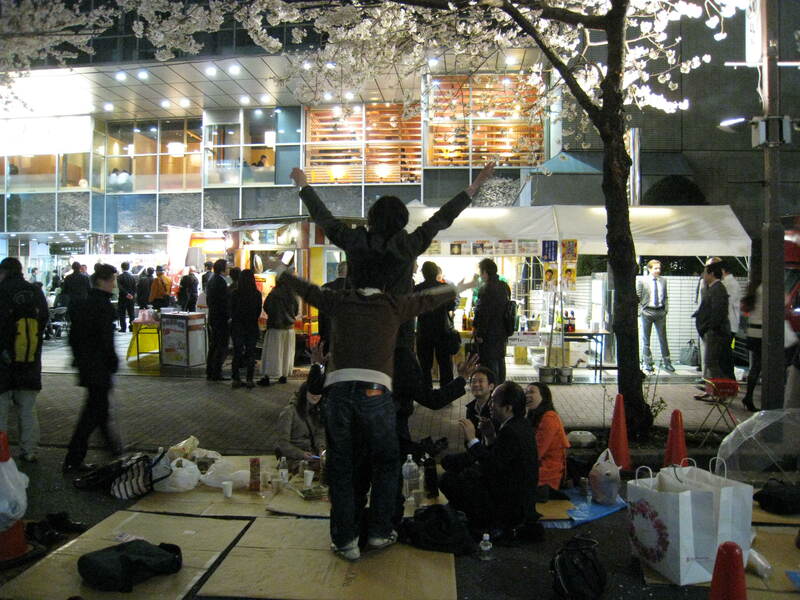 They were enjoying so-called Hanami 花見 (meaning, “seeing flowers”). It is a custom that has been handed down for a thousand years. You are currently reading Cherry Blossom Festival in the City at Woven-Words.